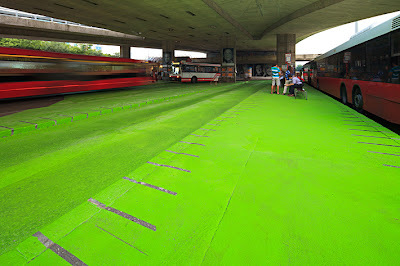 Mit sattem Grün wurde einer Bushaltestelle im slowakischen Bratislava neues Leben eingehaucht. Best Practice Revitalisierung! 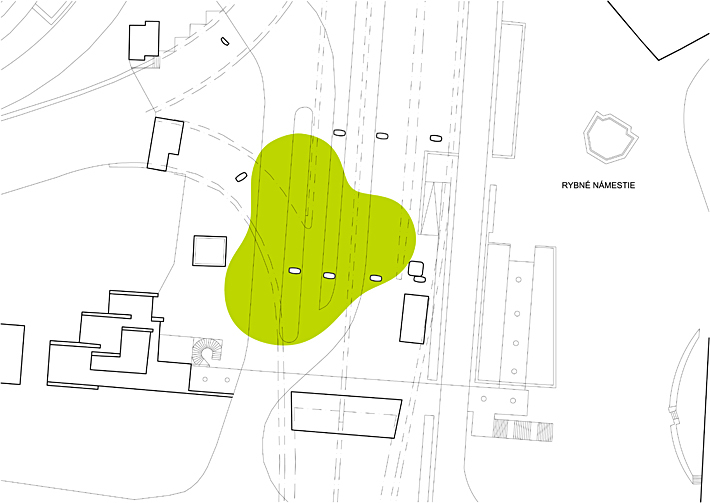 Geringfügige Kosten - große Wirkung: In Zusammenarbeit mit der Civic Association haben Vallo Sadovský Architects das 1.000 qm große Vorzeige-Projekt Green Square zur Revitalisierung des öffentlichen Raumes umgesetzt, als die städtische Verwaltung nicht aktiv wurde, und mahnt damit zum Handeln. The situation in regard to quality of the environment at the bus terminal under the New Bridge in Bratislava has been bad for a long time. 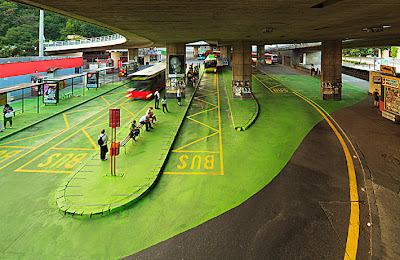 People have to wait for their bus connections in a totally unsuitable area, and we consider it a disgrace that the city of Bratislava leaves its citizens and tax-payers to function in such an inadequate environment. The characteristics of this place directly affect the mood and behaviour of its users, and several disturbances and conflicts have happened here in the past. It is difficult to understand how such an area, only a few metres from a historic square, has remained unnoticed by city officials and for a long time practically unchanged. 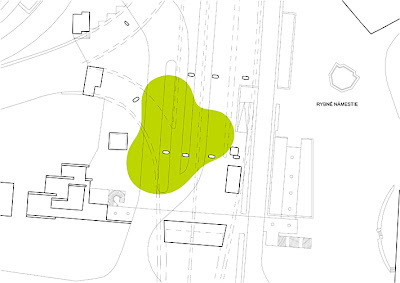 Although Green Square is an instant “intervention”, the cheapest fix, it is also by its “loudness” both a provocation and a call for a more serious approach to this problematic site. It is not only the cheapest method but also simultaneously the most visible attempt to change the atmosphere under the bridge, and to highlight the dysfunctional environment that everyone accepts out of habit. We painted an area of about 1,000 m2 with green road paint. 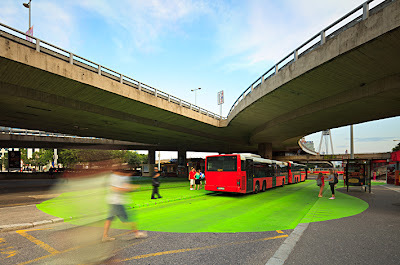 The painting was done with standard material that is used for road surface markings, and road safety glass beads were also applied to the surface to provide reflectivity and prevent slipping. The second part of the design concept, this time graphic, was created by graphic designer Ondrej Gavalda using adhesive tape that was painted over and then peeled off.